Welcome to Boom 21, Waves! This round, everyone will be making blocks due on or before September 22, 2018. Details follow below but anyone who has participated in a recent Boom knows the basics. Although we have only 16 members, go ahead and send me 19 F8s. I’ll distribute the extras so everyone will make and receive 19 blocks. Please wash your yardage, press, remove selvages, cut into F8s (approx. 18x11, no smaller than 18x10), bag in a quart-sized or smaller baggie, label with your name and any requests and then put them into a large ziplock-type envelope inside your mailing envelope with your name and address on it. Remember, you will be shipping with tracking. All fabrics must be in my hands on or before Monday, June 18, 2018 and I will turn around and send them out no later than Friday, June 22, 2018. If all fabrics are in sooner, I'll mail sooner. Please note: Board participation is an essential ingredient in making this swap successful. So much information about the swap is found there, much more than I can possibly write in this sign-up post. It is your responsibility to read all posts and post at least weekly. Subscribing to your group’s thread is helpful. If something comes up and you cannot post, please have somebody email me. Absolutely no disappearing please! Shipping: When you mail to me, please do so in whatever manner you wish as long as you do so with tracking. Please review shipping rules below and be sure to send me the tracking number as soon as you get it. Be sure to include $7.25 for return shipping. If the money/prepaid labels are missing, I will hold your package until I receive it. No checks or PayPal please. Please have fun! It’s time to play with fabric you might not normally use, show your skills, make some new friends, say hello to old ones, and generally enjoy the experience. Let’s go! Please make sure to also refer to the basic policies that apply to all swaps through the board: Rules for Swaps and Similar Activities - Updated 8 December 2010. 1) Use only 100 percent quilting cotton. Please pre-wash and press your fabric without any fragrance residue. Remove selvages before cutting into Fat Eighths, generally about 18” x 11” but no smaller than 18”x 10”, no exceptions! Please keep off-sized pieces for your own use. If you send me smaller pieces, I will return them to you at your expense. 2) When mailing your F8s to me, please make sure they are individually sealed in a quart-sized or smaller ziplock-type bag, no hard zippers please. Label each F8 with your board name easily visible to me along with any instructions or color requests for your fabric. (Do not specify a recipient unless a fabric is being directed to a particular person.) Labels are useful to help the recipient prevent fabric mix-ups, something that’s easy to do. Please then take all the individually wrapped F8s and put them in a ziplock-type bag large enough to accommodate them all onto which you have written your name and address. When you send your completed blocks back to me, please seal and label your completed blocks with the owner’s name and your name easily visible to me in a similar manner as you did the F8s. 3) Please mail your F8s to arrive by Monday, June 18, 2018. The sooner everyone gets them to me, the sooner they go out! Be sure to send me the tracking number as soon as you ship. 4) Carefully handle all fabric received and completed blocks, placing them somewhere safe until mailing time comes. 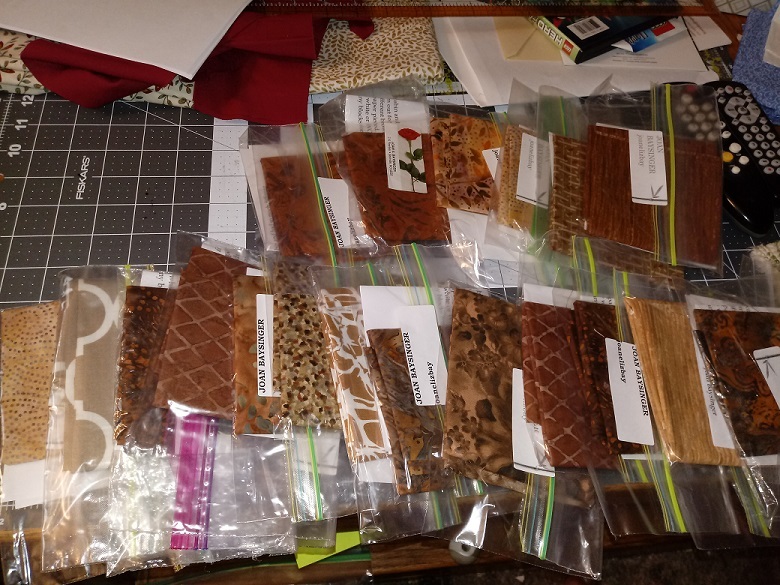 5) To help keep track of the fabrics and blocks made, I will establish an online Fabric Gallery. 6) You are required to keep in touch with your group by posting to the dedicated Boom 21 threads at least every week. This is a requirement. If you don’t wish to keep in touch, this is not the swap for you. 7) All blocks must be completed within the time frame for the group and mailed to me with a tracking number. 8) All blocks must be 12 1/2” unfinished. Blocks may be regularly pieced, paper-pieced, appliquéd, whatever the block maker decides to do. It is up to each individual. Please do not request specific blocks as the idea is to let everyone, of every skill level, select their own blocks to showcase their talents and your fabric. 9) Most importantly, have fun! You must supply me with tracking numbers on all parcels sent to me and I will do likewise when mailing to you. All shipping costs are your responsibility. You may ship to me in whatever tracked package you like however I will only ship to you in USPS Padded Priority Envelopes (unless other arrangements have been made) at the rate in force at the time of shipping. Today that cost is $7.25 but it may change at any time. Please send a pre-paid envelope or label or you may send me $7.25 in well-concealed cash and I will supply the envelope. Envelopes with “regular” postage stamps will no longer be picked up by my carrier but must be taken in person to the post office so please don’t send them. Please note: There is no guarantee all blocks will fit in a single padded envelope if you are in both groups. I will contact you to discuss options if that happens. You must be in good standing with previous swaps. Anyone with a poor track record of fulfilling swap commitments will not be permitted to join. If you sign-up and do not fulfill your commitment, negative feedback will be given. 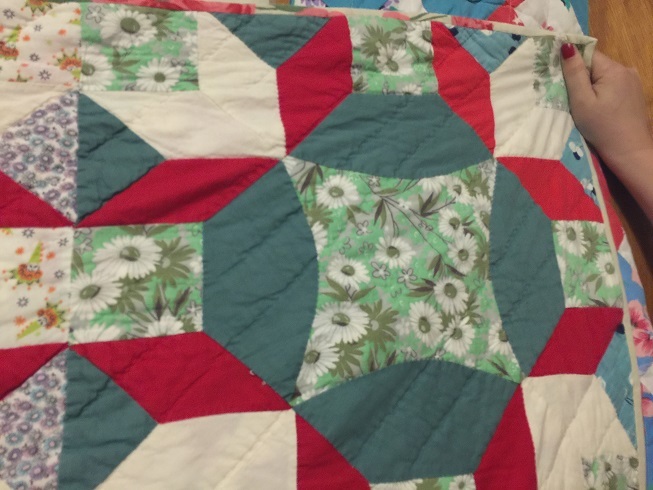 All skill levels are welcome but you must be able to sew a 12 ½ inch, basic, well-constructed block. The block doesn’t have to be detailed but it must not be falling apart. All seams should be ¼ inch or a scant ¼ with at least 12 stitches per inch. All fabric should be cut on the straight of grain to avoid wonkiness and fraying whenever possible. Blocks should not leave your hands until you know you have made every reasonable effort to get them as close to the 12 ½ inch size as you can get. We all respect new quilter’s need to learn and that will be taken into account. If you cannot consistently construct a 12 ½ inch block, this is not the swap for you. Please note: when you measure, measure units with an acrylic ruler as you go so you can pick up errors before the entire block is made. When complete, measure under an acrylic square at least 12 ½ inches square, not on top of it, after pressing. Also, be sure to allow yourself enough time to complete your full set of blocks. In other words, don’t leave them to the last week! The results can be hit-or-miss. And please be sure to clean up the blocks. Turn them over, trim your threads and cut dog ears. 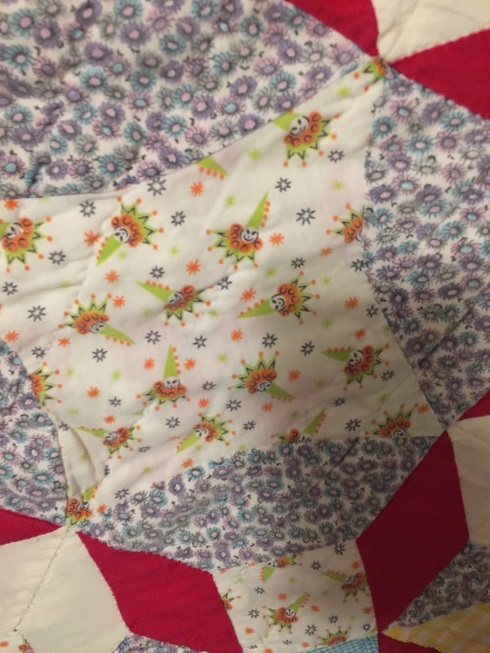 Please pre-wash your 100 percent cotton quilting fabrics without any fragrance residue. Please note that that some swappers may be smokers or have pets. If pets or smoke is a problem for you, this isn’t the swap for you. No public complaints or criticisms for any reason are permitted. All complaints must be addressed by Private Message (PM) or email me at [email protected]. No Exceptions. Oops clicked on the wrong link. Good morning, Waves! 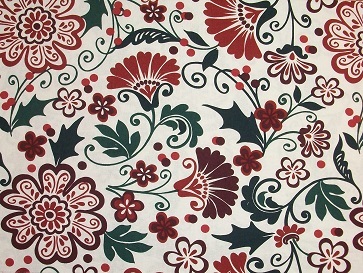 This is the fabric that I'm sending for this group. A big welcome to our new member. I'm asking for a COC or solid background with burgundy accents. I'll use the green for sashing and binding. Let the fun begin! Good morning, Boomers! You found us. I’ve posted pix of your fabrics in gallery already. Should be the first page. If anyone has changed their minds and isn’t going with one posted, let me know and I’ll remove the existing pic. Also, I need a reply to last night’s email so I know you got the info. Thanks! Libster, I love your pretty fabric. Yay, glad you are going to make blocks with us, Janice! It's always more fun when you play. So that brings our group up to 17? * Oh, never mind that! I just saw that your name was in the original list... so 16 still. Waves rolling in to say hi, received email, and off I go again to work. Janice when I click the Dunes link it takes me to the waves??? 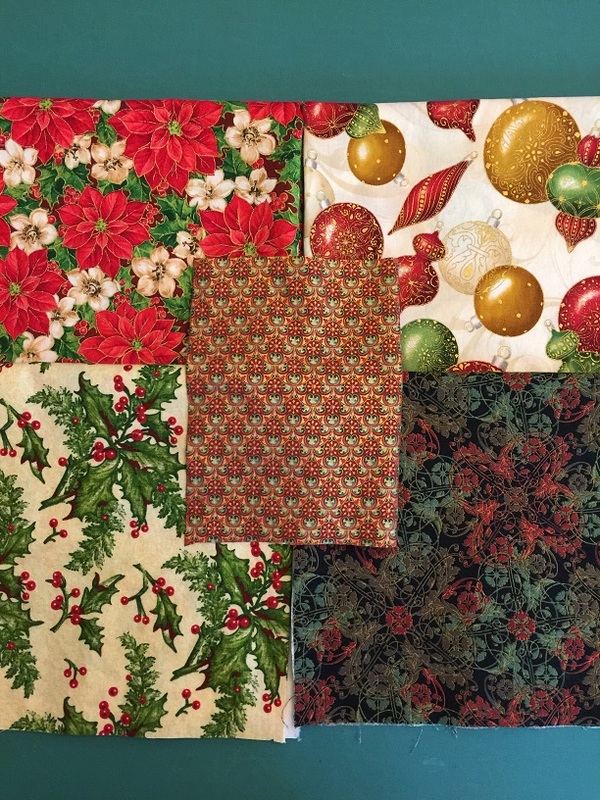 If I would have read further I would have found you sooner Here is a picture of some of my fabrics for both groups. Asking white or WOW with them. Have fun! Here's what I'm sending, and the note that'll be included in each baggie. Hi there! :-) Enclosed is my fabric for the Boom 21 swap. 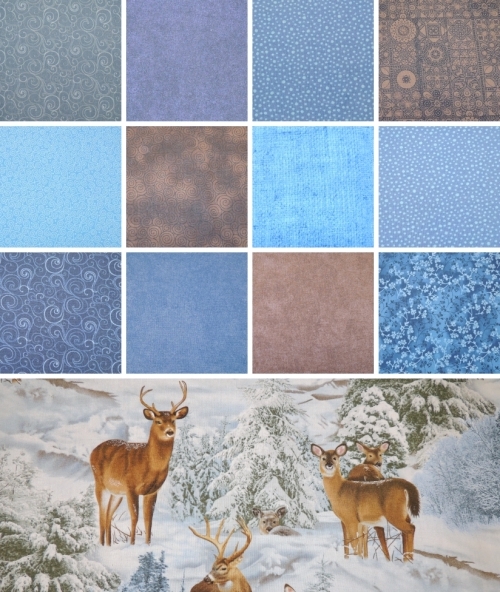 Everyone will receive either a blue or a brown F8, and a smaller piece of deer fabric. If at all possible, please incorporate the deer fabric into the block. If you need to add fabric, please use shades of blues and/or browns. This quilt will be going into our camper, which is a cargo trailer that we converted. My husband loves deer, so the whole camper is done in a deer theme (all blues and browns), with the curtains and other accessories made of the deer fabric. Thanks for swapping with me! The fabric is prettier in person. It was 2am or so when I took the photos, so they're kind of dull. The deer fabric is around 11" x 13" (or equivalent), and the blue/brown F8s are generously cut, so there should be plenty to work with. Nope, 16. I was undecided until I posted my name but I'd counted myself in the group already. So really, I guess I'd decided the moment I said 16. I am waving at the Waves! Great to be working with you all again. This BOOM I'm sending fabric for a patriotic themed quilt. Any color that works for you with this fabric is fine with me. (My stripes have brown in them, too.) Any design for the square will work perfectly with what I envision. It doesn't have to be a patriotic themed block, just patriotic colors. 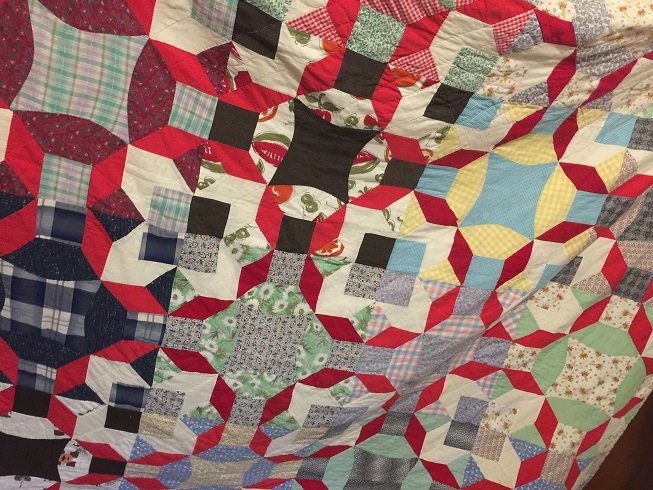 My son who served in the Army will be the recipient of this quilt. Thank you for your creative genius to help me get this quilt done! Thank you for the gallery!!! Joan, those are some yummy browns! And Moonrise, I love the deer... so peaceful. Ibex, great to know who your quilt is for. I know I have patriotic colors in my stash. Sorry to give you one more note to keep on your famous clipboard! Oooh! I love that ornament fabric! The poinsettias, too. 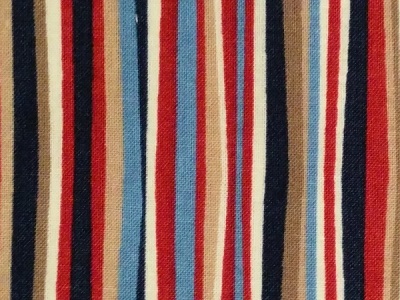 The patriotic stripes are also fun. In fact, I have an idea already! I love paisley! And how nice that you have a machine big enough to quilt a king size quilt now! 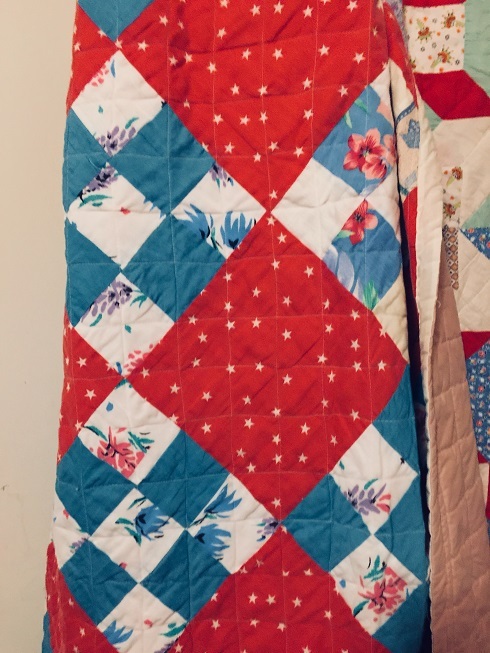 I thought you all might like to see a couple of great old quilts I spied at an estate sale this past weekend. Didn't buy, but I loved them. It had some great old fabrics! Oh sewbiz, can you imagine what Boomers would come up with for those creepy clowns?!! 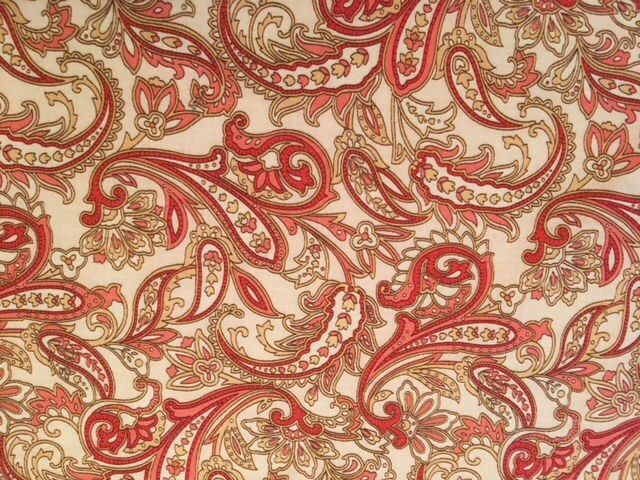 Love this fabric, Terri! What are you asking to go with it? Hi Libster it’s great to see a picture of you. Now have a face to go with the name. Still trying to figure out what to as to go with the fabric? Colors in the fabric, maybe some deep greens or browns. I kind of like the darker pink as a contrast, since most of your print is light. Hard to say what a third color should be... maybe the cream background? What do you want to see on your bed?